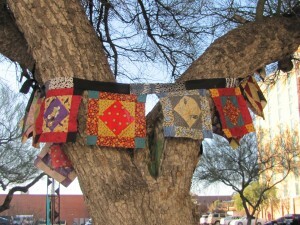 You have heard of ‘yarn bombing,’ well now a group I belong to, the Fiber Artists of Southern Arizona, has invented the quilt bomb! Inspired by Olek’s yarn bombing of the Wall Street bull, we had a blast doing the installation last night. A link to a video of the late-night installation is here. 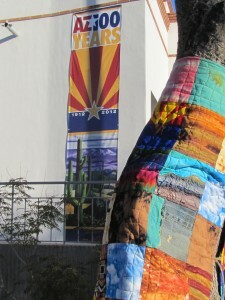 FASA chose the Arizona Historical Society as the site of the world’s first quilt bomb because it is co-hosting the exhibition ‘One Hundred Years, One Hundred Quilts’ with the Arizona Quilters Hall of Fame as part of the state centennial celebrations. 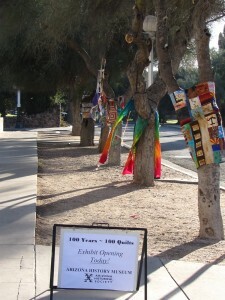 A reception for the quilters was held this morning and was virtually a ‘Who’s Who’ of Arizona quilters. You can see the exhibition through the end of 2012. The work of FASA artists has roots in the quilting tradition, and we thought it was a great way to honor our past and celebrate the state of today’s art quilt. 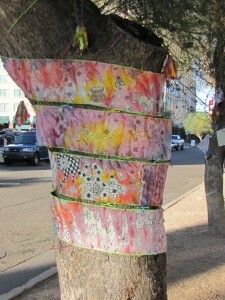 People who come to the exhibition can see that quilts can come off the bed, off the walls, and even onto the trees! FASA is Barbara Hall, Trisha Hastings-Sargent, Joanne Krawchuk, Sandy Lambert, Sharon Nemirov, Aimee Smythe, Peggie Thomas, Mary Vaneecke and Kay Wild. 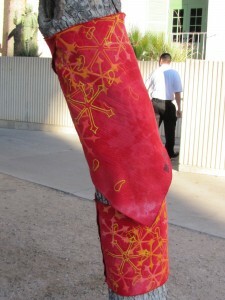 UPDATE: The Arizona Historical Society has offered to make the quilt bomb a part of the exhibition’s history….Needless to say, we are thrilled. The installation will be removed on Monday, February 27. Photos follow. Please share this link with all your quilt/fiber art friends…. 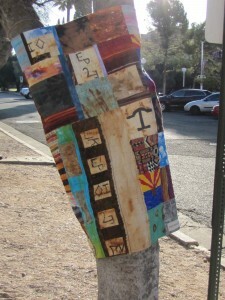 World’s First Quilt Bomb, Tucson, AZ, February 18, 2012. 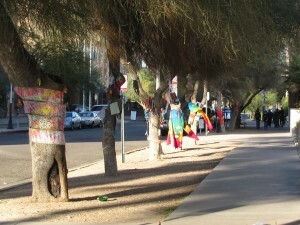 A long view of the quilt bomb. A total of nine pieces were installed. 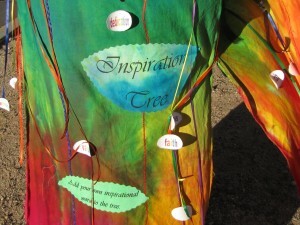 Viewers are asked to write their own inspirational words and attach them to the work. 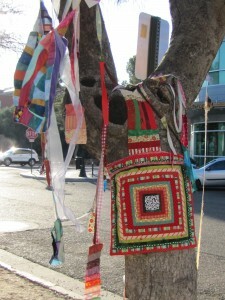 Barbara Hall installed prayer flags of quilt blocks she made during her mother’s final illness. Joanne Krawchuk used several experimental pieces for her installation. Kay Wild’s festive contribution to the quilt bomb. I used a hand-dyed, painted piece from my ‘Samaras’ series. Peggie Thomas’ work includes rust dyeing and some of her ranching family’s brands. 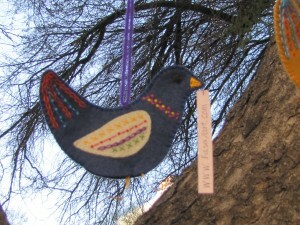 Sandy Lambert’s ‘Bird House’ installation includes a string of charming felt birds. Trisha Hastings-Sargent’s installation is inspired by the color palette of her stitched landscapes. This is so beautiful! Excellent workmanship, wonderful colors and too much fun! I love it! Glad you like it. It is now INSIDE the museum…our group is thrilled. Those trees have brought me pleasure every morning this week on my way to work at the UA. I assumed the quilts were a museum project. I’m so glad to know they actually represent the worlds first quilt bombing! 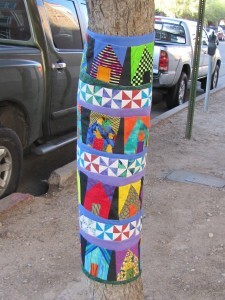 Dana–So glad you were able to enjoy the quilt bomb in person. 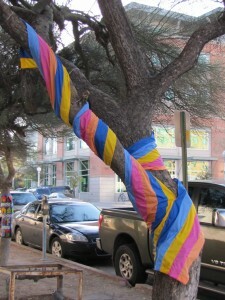 On Monday, the installation will be removed from the trees and put inside the museum with the rest of the quilts…. I took a walk today at lunch time and stopped by to see this in person – Pretty Cool!! You ladies rock! So glad you were able to see it ‘up close and personal.’ Photos just can’t do it justice, somehow. It will be up until Monday. Makes you think about them in a whole new way, doesn’t it? Love this idea. Hope it catches on in other places. How long will you leave it up? The museum has asked that it be left up until Monday, 2/27, and then it will become part of the exhibit’s history…it’s very exciting! It does sound like it is the beginning of a movement. Do send pictures if you do something like this in your town. HEY MARY: FANTASTIC!! BEAUTIFUL!! GORGEOUS!! I AM SO PROUD OF YOU. THAT IS REALLY UNIQUE. YOU ARE THE GREATEST. I LOVE YOU. Wonderful to see all this beauty! Hope to see this idea catch on across the country! HOW GLORIOUS!!!! to see the trees dressed in such grand array! Truly a rainbow of color and talent. My problem is I now have NO buttons on my Blouse LOL. 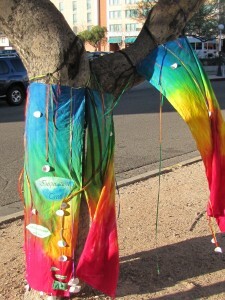 Beautiful and a wonderful way to bring attention to quilting! Glad you enjoyed it, Darcy! I wish it had been promoted more, I hadn’t heard anything about it. I’m sorry I missed it. What creativity! 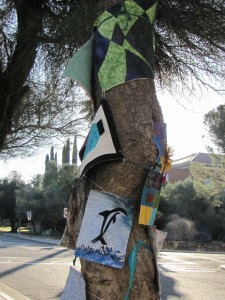 For now the quilt bomb is still up, and the quilt exhibition will be up until the end of 2012. Do see it if you have the chance. Walking up to the exhibit Sauturday A.M. I noticed the ‘bombs’ and was impressed by the creativity of my fellow quilters. The exhibit is incredible and the commitment of the museum should be applauded, Arizona is truly a heartbeat of quilting in the USA. So glad you were able to see it in person! The photos don’t do it justice! The PBQ have struck again, bringing the total to 1321!! I couldn’t agree more, Martha. We had a terrific time planning and installing the quilts…. And your project of 1321 pillow cases is sure one you can be proud of! Congrats to you, too. Way cool, Mary. Thanks for letting us see it. Glad you enjoyed it, Brenda. I highly recommend it as a group project…. How glorious! The colors are magnificent and welcoming. Please show the 100 quilts on display. There is a catalog for the exhibition that is available through the Arizona Historical Society. They also produced a documentary DVD by Daniel Buckley that is available for purchase. The film features interviews of some of the quiltmakers… I can’t wait to see it myself.